Okami is an action-adventure video game released on Playstation 2 and Wii. And this is not a game guide; it doesn't show you how to take on enemies. Okami features the most unique art direction I've seen for any computer game. It is heavily inspired by Japanese watercolour painting and wood carving art of the Ukiyo-e style. It's an amazing concept to combine watercolour in computer game art, moreover, use it in the actual game itself. This thick 288-page art book is filled to the brim with content. 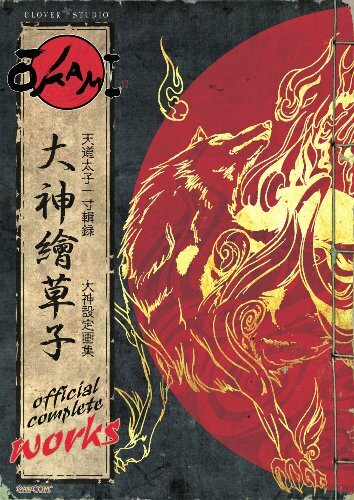 There are official character art including the concept sketches, storyboards, paintings created by by Issun the Celestial Envoy while on journey with Okami Amaterasu and even some music sheets at the end. The application of watercolour to create cute character design is very refreshing. Everything in the book is captioned. Characters have their introductions. The character designs are explained to the detail of why they wear what they wear. Concept sketches come with artists' reflection. And then there's the journal of Issun, which is a whole big section by itself. There's so much stuff to read, so much information and stories into background of the characters and places. This book is highly recommended and worth taking a look even if you have no idea what the game Okami is about. The original Japanese edition 大神絵草子 絆 -大神設定画集- can be found on Amazon.co.jp. Great game and what an amazing looking book. Thanks for the review. I'm hoping you might be able to help me find this book somewhere. I don't know if you might have come across it on some trust worthy site, but everywhere I look for it it seems to be on some ultra-sketchy site, 999 dollars, or "temporarily" out of stock. Thanks for the review. I want this book DESPERATELY, and I cannot stress that enough. D E S P E R A T E L Y.
Amazon France and Germany, and Barnes and Nobles are still selling it. This book seems to be out of print. I don't see it anywhere in Singapore, or anywhere else on online bookshops. Amazon Japan has the Japanese version called 大神絵草子 絆 -大神設定画集- if you don't mind the Japanese text. Hi there Parka, just to let you know that udon has reprinted the book, it's now available again on amazon.com for now. So get it now and hope it will come to amazon.co.uk where i usually buy. Awesome news, hope it does arrive at amazon.co.uk. :) Thanks for letting us know Luis! Been looking for this book for ages. I have this art book & it is my favorite out of my entire collection. There is simply so much content & incredible imagination with extremely unique Japanese art direction. The game is also one of the best ever. This developer's latest game, Bayonetta, also has some of the best art I have seen. Apparently, they will be releasing a similar full-fledged art book for it as well (which I cannot wait for). I actually sent a mail to Udon asking about this book, and they replied that they were just about to finish reprinting and were starting to sent it to sellers again. But now it seems that the book is not selling (aside from used and marketplace) in amazon.co.uk. If it's one art book I wished I bought in English, it's this one. Now I know how Udon's version is like. Thanks for the review! i want to thank you for finally convincing me to buy this. I stumbled onto your site yesterday while looking for videogame and anime artbooks as I had been over on the UDON website looking at theirs but couldnt find a good resource for information on them. Your review completely sold me (ok, I wanted to buy it already but kept putting it off lol) on the Okami Artbook, and having just recieved it in the post about an hour ago I can safely say I wholeheartedly agree with you!! I picked up this book when it was reprinted in January and it is amazing! Having played both versions of Okami so far and waiting for Okamiden I thought it was amazing! I must thank you for bringing my attention to the fact it was getting a reprint otherwise I would have missed it again!